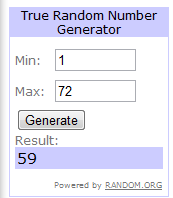 And the winner of Eggnots Dyable Ceramic Eggs is #59! Bylly A wrote, “I would love to win Eggnots for my allergic 3yr old!” Bylly A, email your mailing address to me at realfoodallergyfree @ gmail . com (remove the spaces). Thank you to all of you who entered and helped spread the word about this wonderful product!